Established with a 2012 award from Campaign to Protect Rural England for our contribution to preserving Gloucestershire’s traditional orchards and apple varieties. An exciting venture started here at Day’s Cottage in early 2009. The Gloucestershire Orchard Trust received a grant from the Gloucestershire Environment Trust, making possible the establishment of an Orchard Skills Centre – an outdoor centre for running workshops on all aspects of orchard management and other rural skills. Dave, a teacher before he became interested in orchards, is highly experienced at running courses. “Many people aren’t aware that you can’t simply plant an apple pip and grow a tree that will produce the same apple. 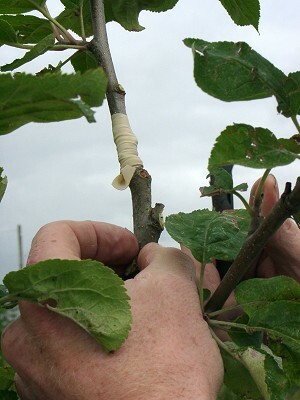 Our courses teach people the ancient arts of grafting and budding, and give them the satisfaction of creating a new tree for themselves, sometimes from a much loved old tree in a relative’s garden.” explained Helen. The centre, nestling amongst the old orchards at Day’s Cottage, is designed to be as low impact and sustainable as possible, with temporary buildings using local resources wherever possible. The unique 12 sided, canvas roofed outdoor workshop is constructed from local sweet chestnut with pegged joints. 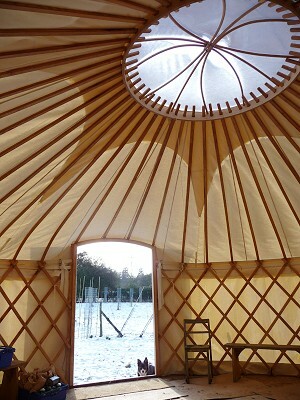 A warm indoor space is provided by a locally made yurt surrounded by a circular garden of fruit trees, grown as cordons and espaliers. A demonstration orchard has also been planted for pruning courses, and a new nursery bed for newly grafted trees for sale, mainly of local Gloucestershire varieties. The facilities also include a composting toilet (with a stained glass window!) A beautiful outdoor wood fired oven produces tasty pizzas for workshop participants and other users of the site. Helen and Dave are planning to make the facilities available for other rural skills workshops and aim to gradually develop an annual programme including living willow, basket making, green woodwork, dry stone walling and hedge laying.